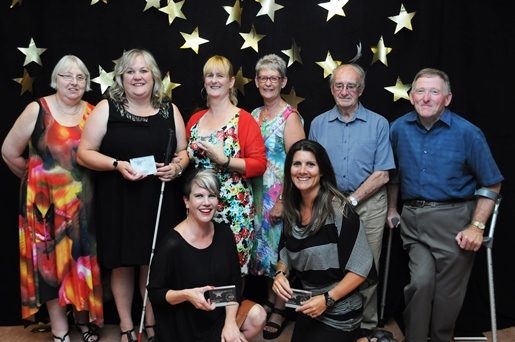 The 2016 STAR Awards was a night to celebrate our star staff and volunteers. Each of the finalists epitomise what being a STAR means, contributing in an extraordinary way to the success and culture of the Blind Foundation. The event held at the Parnell Blind Foundation Recreation centre in Auckland was a night packed full of entertainment and celebration. Guests enjoyed the sounds of talented musician and Blind Foundation client Jono Heaps. His incredible voice and keyboard skills filled the room throughout the night. Here is the list of the 2016 winners. Please show your support when you next run in to them! Julie takes every opportunity to spread the word about blindness and our work. Last year she spearheaded the Otago Rail Trail fundraiser. Julie’s impact on others and the Blind Foundation is broad and extremely positive. Paulette has a drive to make a difference and provide the best for all her clients. In 2014 Paulette took a leading role in organising to get her client to Space Camp in the United States. Saba consistently displays the highest levels of customer service, always putting in 120%! She has an ability to say ‘yes’ to everything and deliver on it and does it exceptionally well. Chris led the launch of our first mobile application for the delivery of library services. He has created a legacy and has instilled a belief that we can be agile, flexible and innovative for the betterment of our clients. Pat is always positive, willing to help and go the extra mile. He promotes a positive image of the Blind Foundation in his dealings with clients, volunteers and the wider community. A natural leader, Mark is someone his team can turn to and ask for advice or direction. He is forward focused and always striving to improve upon the delivery and service of the children’s team. Their job is often unpredictable as they support everyone in their office, yet no matter how many multiple demands they have in any one hour or day, their response to a new request is always positive and helpful. Neil has provided exemplary support to countless the blind community since the early 1980s. The support Neil has provided has made a huge difference to the lives of many people. Congratulations to all the finalists, and especially the winners for each of the categories, well done to all.